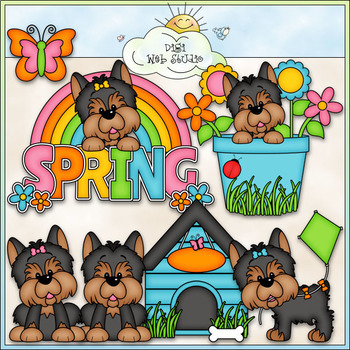 This Spring Yorkies / Yorkshire Terrier Dogs Clip Art and Black and White set comes with 7 Color Images and 7 Black and White Images. All images are high quality 300 dpi for beautiful printing results. Includes: 1 yorkie with a bow, 1 plain yorkie, 1 yorkie in a flower pot with flowers, 1 yorkie flying a kite, 1 word art of: SPRING with a rainbow, yorkie and flowers, 1 butterfly, 1 dog house in the grass with a dog bone.